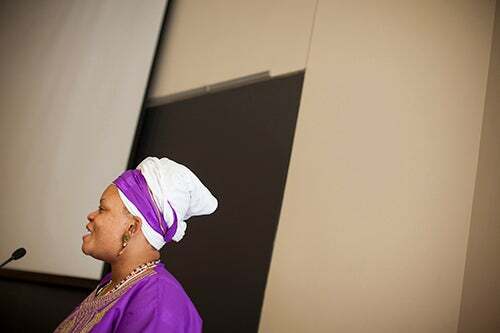 Through the “Divine Space and Sacred Territories” conference, the visiting scholars from New England, New York, Georgia, Florida, and Nigeria touched on Yorùbá, its Caribbean cousin Vodou, and other practices from humankind’s genetic ancestral home. “We are all Africans,” said keynote speaker Baba John Mason (pictured). “Divine Space and Sacred Territories” sounds like something you find in church. But this felicitous phrase was the name of the inaugural conference of Harvard’s African and Diasporic Religious Studies Association, the only such group in North America. What has this religious diaspora done to influence modern spiritual practice? A lot, the scholars said, including providing a sense of the Earth as sacred and healing. And what can such religious influences — most of them from a preliterate era — offer current spiritual practice? Again, much, say the experts, including a sense that the divine may reside in everyday objects, in movement, and in the body itself. Funlayo E. Wood, association director and Harvard doctoral student, introduced the inaugural conference. Such practices offer timely lessons. For one, they bring to bear those natural entities deserving honor and protection, including the Earth itself. “Destroying the land equates to human genocide,” said presenter Yoknyam Dabale, a Nigerian-born blogger who is a master’s degree student at Boston College. Dabale added that female spirits are custodians of the land. It was a reminder of another lesson from Africa’s religious diaspora: the spiritual power of the feminine. Within Christianity, at least, that note remains muted. Dabale said that both modern Africa and the Americas are in need of the balancing, life-giving spiritual power of the feminine. Also deserving of honor and protection, according to these diasporic traditions, are ancestors, who represent the wisdom of the past; elders, who represent the wisdom of the present; and communities, which represent the wisdom of cooperation. That well-ordered life is embodied in the termite mound, said Mason. The shape of these towering cylindrical mounds is echoed in sacred mud structures seen throughout the Yorùbá homeland of northwest Africa. Historian Suzanne Preston Blier, whose reflections on African sacred beliefs opened the conference, remarked on the same ubiquity of these architectural features, these “hollow residences of spirits,” she said, that attract protection and good will. Blier, who is the Allen Whitehill Clowes Chair of Fine Arts and professor of African and African American Studies, also talked about mapping sacred space using modern geographic information systems (GIS) and computer technologies. An interactive project is already under way, she said, in the Africa section of Harvard’s WorldMap. Also deserving of care are our own bodies. “Your body is a temple — ritual space that you design,” said Mason, a Yorùbá priest and founder of the Brooklyn-based Yorùbá Theological Archministry. The body is in special need of protection these days, said therapist, interfaith minister, and Yorùbá priestess DeShannon Bowens, especially for “cultural groups with a history of violent oppression, (where) traumas on the body go back to the time of their enslavement.” A sexual assault takes place every 2.5 minutes in the United States alone, she said, adding that one in every three or four girls (and one in six boys) will be sexually assaulted in their lifetimes. The conference seemed to say: Bring the body back to spirituality. It also seemed to say: Bring back the portability of the sacred. In a gathering whose main theme was divine space, a lesson emerged from Africa’s spiritual diaspora: In a world of churches, temples, and mosques, the sacred does not require a building; it is present in everyday life. Blier talked about sacred groves, pathways littered with glittering mica, roots, stones, and trees with meaning. Clooney talked about sacred spaces in the world created by tragedy, like ground zero in New York, and about Harvard’s own “quasi-sacred spaces,” including Memorial Church, Memorial Hall, and the glittering toe on one foot of the John Harvard statute, a lucky touchstone for thousands of tourists ever year. On Thursday and Friday, about 800 of Harvard Business School’s roughly 11,000 alumnae — including some of those intrepid early graduates — descended on the Allston campus for the start of the W50 Summit, two days of reflection, celebration, and brainstorming on women’s experiences at HBS and beyond.